When Kathy Denby-Wrightson and I decided to write The Beginning Dressage Book, we couldn’t have chosen a better time—or a better title. American riders had been introduced to dressage years earlier, but the first teams were all military, and all men. Most existing books were written by military officers who assumed that their readers were their peers, knowledgeable enough to compete internationally in other horse sports. The rest were usually translations from German or French. Even though women made their first appearance in dressage in 1952, by the early 1970s, they were still a very small minority of the horse-riding public. Our book helped to change that. 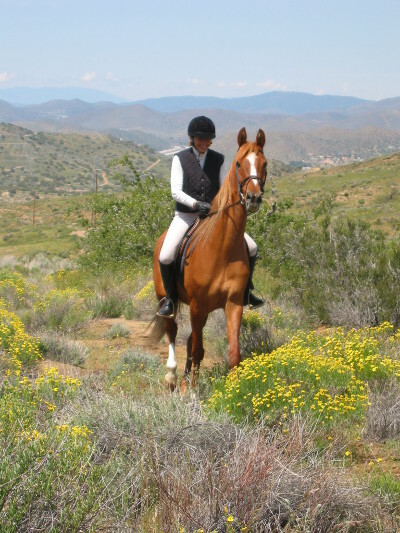 When I first met Kathy at La Jolla Farms near Del Mar, California, she was a professional trainer. Canadian by birth, she had studied dressage in Europe with masters like Alois Podhajsky, former director of the Spanish Riding School in Vienna, and the former coaches of the Swedish Olympic team and the Danish Olympic team. She had even been approached by another coach who wanted her to ride for his country. “Nobody competes in the Olympics just once,” Kathy told me. It requires a commitment—usually a life-long one—and she was more interested in having a family. We began writing the book after she moved to Hanover, NH, to marry a veterinarian. At the time I was married to a neurobiologist at the Salk Institute, right next door (they shared beach space) to La Jolla Farms. In a very unlikely coincidence, my husband had just taken a new job at Dartmouth Medical School—also in Hanover, NH. That first winter, Kathy and I huddled in front of her fireplace—homesick California girls with fading suntans. No skiing for us—winter sports were out. We hated winter, period—too cold, and we couldn’t ride. So we did the next best thing—we wrote a book about riding. Kathy was the expert in dressage, and said what she was thinking into a microphone. I went home and transcribed it, rearranging sentences, paragraphs, entire chapters. Once spring came, I turned into Kathy’s willing pupil: she applied her techniques to me and my horse, and we wrote the rest of the book. After a few false starts—an editor left all our photos on the subway, so we had to re-shoot everything; my husband hated the winters even more than I did and we moved back to Southern California, where I fell in love with an American Saddlebred trainer, divorced the neurobiologist and married John—we finished it. The Beginning Dressage Book came out in 1981 from Arco Publishing and was an immediate success simply because there was nothing like it on the market. The book remained in print for almost 20 years. Shortly after that I signed a contract with The Lyons Press to write Backyard Horsekeeping: The Only Guide You’ll Ever Need. 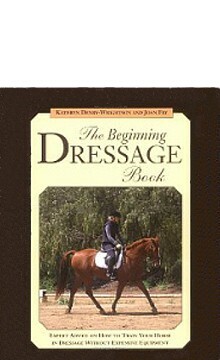 My editor, who remembered The Beginning Dressage Book, decided to put out a revised edition. 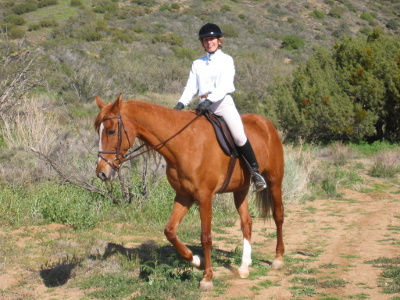 But first we had to update all the photos of riders, mainly Kathy, because none of them wore a safety helmet. The revised edition came out in paperback in 2003, with praise from every horse periodical that reviewed it. The editor of Dressage & Eventing Magazine observed, “Its appeal comes as much from how the information is transmitted as the information itself : the style is straightforward breeze-chatty, as if the reader were taking a lesson from an enthusiastic quick-to-point-out, quick-to-forgive instructor.” The Horseman’s Yankee Pedlar gave it five blue ribbons (out of a possible five). As of right now, three hundred and seventy four Amazon readers have given it four and a half stars (out of five). I’m very proud of the book itself, and its long run.